We use our garage to enter the house on a daily basis and all of our coats and shoes go either in the garage or mudroom/laundry room, which you can see on the left of the photo above. I’ve posted about this space before, which you can read all about HERE. 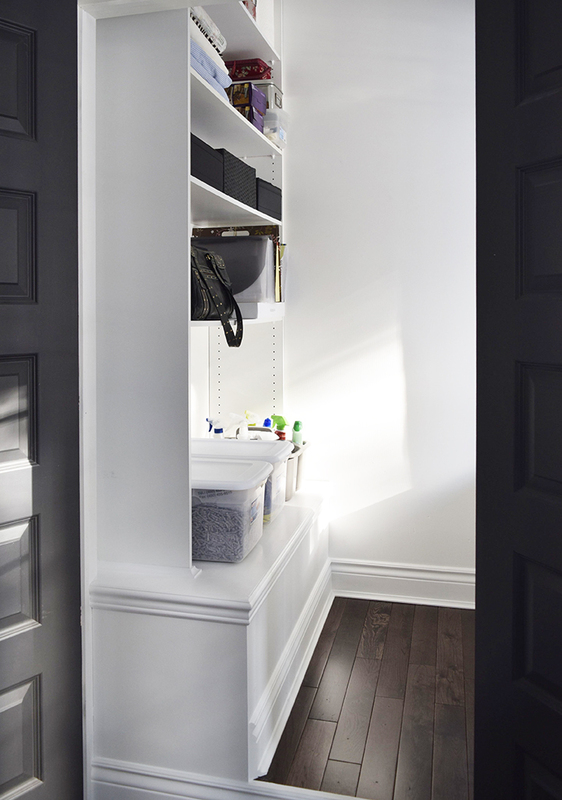 Our front utility closet is what I’m showing you today. 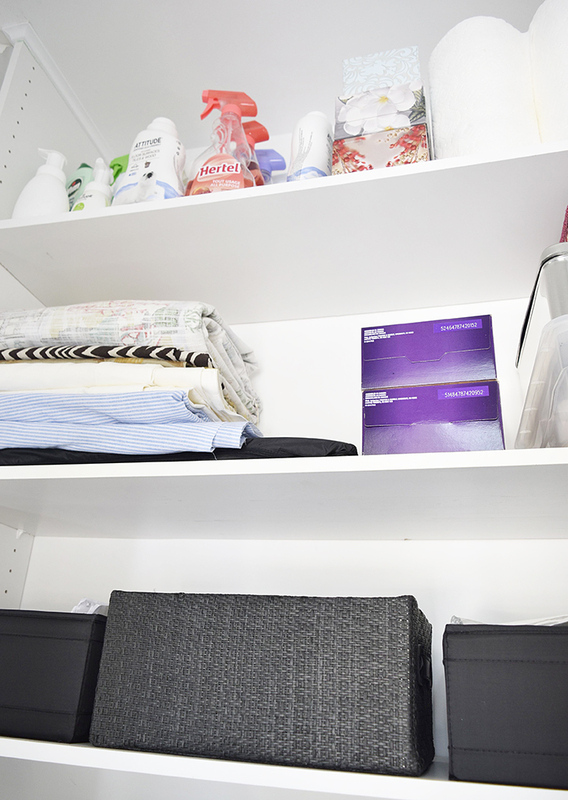 There’s really nothing fancy about it at all, but what I wanted to discuss is the fact that I use it as a utility closet rather than a coat closet. When designing the house with our builder, we tried to maximize space as much as possible while keeping an open, airy feel to the house. The front closet, was originally on the left of the front door as you enter and the dining room was on the right. We changed many things in the layout and ended up tucking in the coset on the right. It has a bench-like component to it, which is there because of ceiling in the staircase going to the basement. We decide to build shelves from the base of that ‘bench’ to the ceiling for lots of storage. We do plan on adding wall hooks for guest’s coats, perhaps with a shallow shelf above it as well. 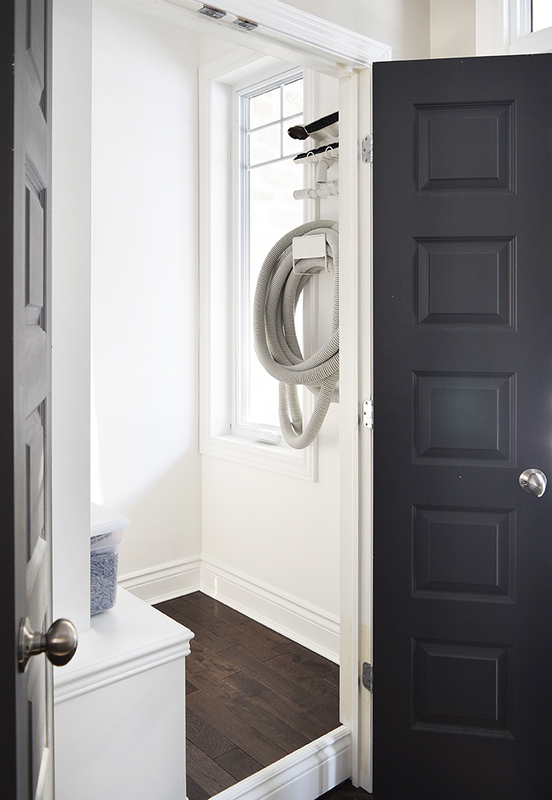 There’s a window in the closet that we kept here when designing the house, as it was part of the front elevation and we felt the exterior needed to have the window.. We hung the vacuum on the wall next to the window – no more wrestling matches for me! The floor is raised, also because of the staircase. We finished it with the same hardwood flooring as everywhere else for a clean and consistent look. My husband wanted the trim to tie in as well, so we used a combination of baseboard, chair rail and quarter round. We used mdf shelving and sides with pre-drilled holes for adjustable shelving. Eventually when we decide to sell the house, we plan to remove some shelving and add a rod for hanging coats as well. On the bottom shelf, we keep our pet supplies in the large bins and a caddy full of cleaning supplies, which I use daily. On the second, third and fourth shelves, I keep work supplies, sewing and some craft supplies. At the very top is extra cleaning supplies, kleenex and paper towels. As you can see, there’s nothing pretty in here! I will eventually buy some cute baskets for a uniform look that has a more styled and decorated feel, once we hang the coat hooks and shelf. So I’m not finished with this space yet and it isn’t as pretty as I’d like, but I can assure you it is light years ahead of what it was! I really wish I had some before shots!! We’ll probably eventually upgrade the selves to wood rather than mdf, for a nicer, richer look as well. 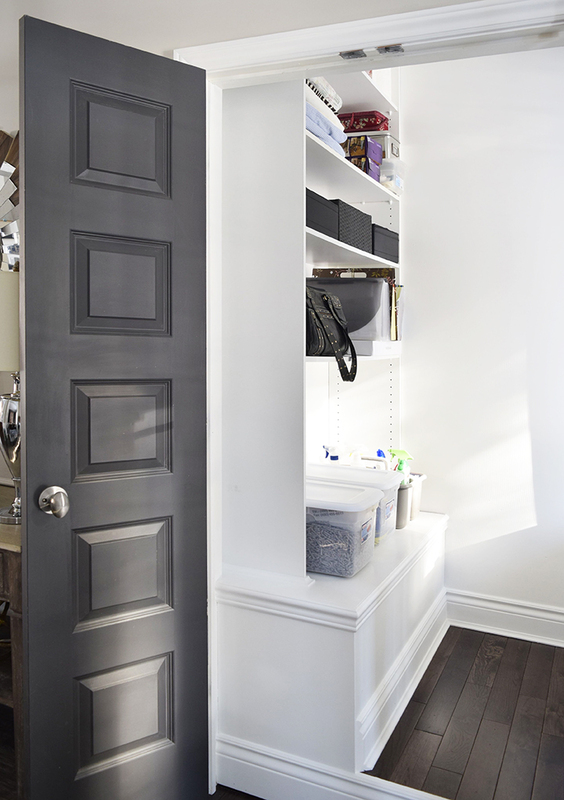 What a great idea for the utility closet. I am going to use your design! I love the rug in your entry hall, where can it be purchased? Loving all of your decor. Thank you! It is definitely very convenient! I’m so happy to hear you’re inspired! The rug is from Home Depot and I purchased it quite a while ago! But you’ve given me an idea to source some rugs – you’re not the first person to ask me :) I will do a post with options for purchasing, so stay tuned! Thanks so much for stopping by! I was wondering what color you painted the interior doors? 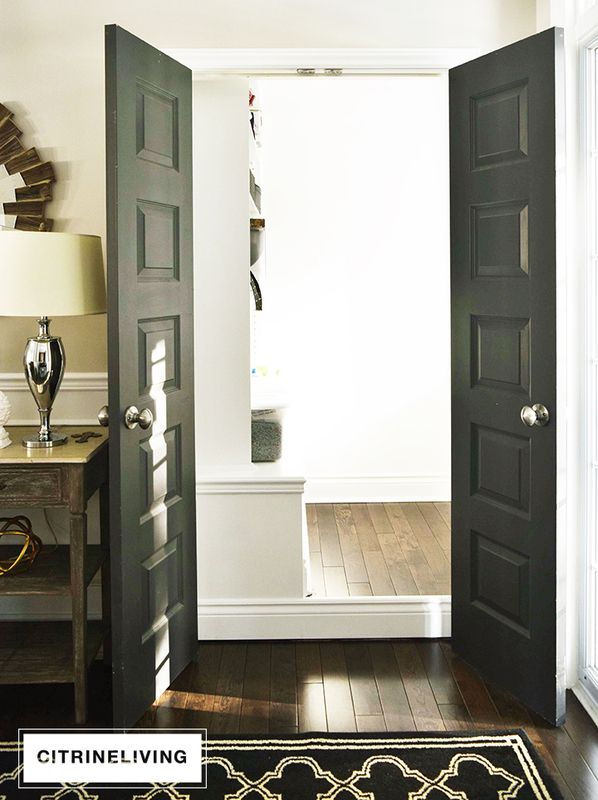 Just wondering what finish of paint you used on the interior doors? ex. Satin, semi gloss? I actually used eggshell because I already had it, but I strongly recommend at least a satin finish!